A good lessons learned process is essential to a successful Governance environment. Collecting, sharing and most importantly learning from the hard won lessons of earlier projects is the thing which helps project managers deliver projects with better awareness and improved risk management. Traditionally this has always been very difficult to achieve with Project Managers naturally shy to talk about any issues on their projects and often the dusty reports are unavailable for easy use by following projects. Even most software systems have been very poor in this regard…many not even offering a Lessons Learned capability with projects as silos and often archived on completion. As you would expect PROJECT in a box goes a long way beyond this and provides you with a framework for an excellent Lessons Learned Library and an invaluable resource for your business. Why not watch the Video Tour to find out more. You can use any type of document you want within PROJECT in a box to collect Lessons. Most project methodologies include End Project/Programme reports with an area for Lessons. Many projects have a separate Lessons Log. The lessons containing documents are then live shared to the central Lessons learned library. As users make changes to lessons documents in the project they reflect immediately in the library. Even when the project is finally finished and archived from the server the ‘shared’ documents will persist in the Lessons Learned Library. PIAB automatically indexes the contents of the Library. So the results of your searches show which versions of the document the terms occurred in. 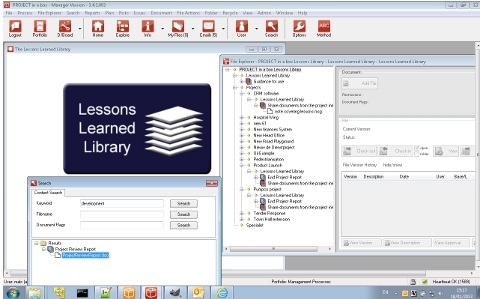 Users can see how changes to lessons evolved in the files. This approach is very flexible allowing lessons to be collected in any format including email notes etc. You decide who has access to the Lessons Learned Library using the permissions model. Your Library can be made available to all or selected people to suit your needs. Users can then find our about relevant lessons from earlier projects very easily. Permitted users can either browse the list of projects and read all information on a certain project. Or a user can use the keyword search to search the indexed contents of the entire library to see when subjects match. The administrator or PSO team may also choose to produce some summary or key lessons documents. Often these include direct links to the source lessons documentation to help people get up to speed quickly. The PMO team can also use the assurance tools to keep an eye on who has been using the library.